As an Apple user I was intrigued to see what they would release, then disappointed on launch, but I’m afraid I don’t follow the crowd when it comes to all the gushing sentiment. I was lucky enough to have the iPhone 5 land on my desk in work a week ago on launch day while other humans and celebrities were queuing down the road in Regent Street. When I opened the box, yes, I was initially impressed that it had slimmed down and was much lighter to hold. But that’s where it all stopped for me. The amount of reviews I have read with the word “beautiful” to describe the device, you would think I was reading a romance novel. One article used the adjective five times, twice in one sentence – ever heard of a thesaurus? There is a divide in the Computer Weekly office, you seem to either love the iPhone or hate it. I personally land on the side of love, I have had my iPhone 4S for three months and my iPad 2 for a year and, my iPad in particular, I couldn’t live without. That said, I still can’t seem to justify the extended enthusiasm and amount of praise this new Apple product has received. I was angered by the lack of innovation, and unlike others, an upgrade to the A6 chip and superficial changes can’t take that away. Wireless charging from the Nokia Lumia 920?? NFC capabilities like the Samsung Galaxy SIII to jump-start the use of mobile money?? These are two examples where mobile devices are making changes to the industry, but without the King of smartphones Apple jumping aboard, there’s little hope for innovation to take off on a mass scale. A major difference to the look and feel of the iPhone 5 it is bigger yet has shed a few pounds. Rather like the supermodels gracing the catwalk at London Fashion Week, the device has been stretched and is longer, thinner and lighter than ever. It weighs 112g and is 123.8mm x 58.6mm x 7.6 mm. It now also has a silver aluminium backplate which aids to its significant weightloss. While it does offer more grip, I find it very cold to touch and there have been complaints from users where the aluminium shows up scratches much more. Yes the screen is ever so slightly sharper, meaning that the apps are brighter in contrast. But it still took me lining up my iPhone 4S against the 5 looking so close at the screen that my nose bumped the “beautiful” glass to notice this. After reading one review which described how they thought the removal of one layer of glass felt like you were touching the pixels on the screen, my eyebrows couldn’t actually raise any higher into my hairline. There is also no difference in the response time of scrolling through the device and opening apps. Except for the camera which opens a fraction of a second quicker than the 4S, but not at the speeds of the Motorola Razr i which boasts being able to open up the camera in under a second. Available in 16/32/64GB storage as well as 1 GB RAM, no expandable memory, but 5GB of iCloud is offered for free as standard. It features an upgrade to an Apple A6 chipset, with a dual-core 1.2 GHz CPU. First device in the UK able to connect to the super-fast mobile broadband, 4G. However at the moment you have to be an EE customer to be able to use this. Other operators should be allowed to offer 4G services within the next year. The camera remains as an 8MP camera, but takes slightly better shots in the dark. However, take an image of the sun or a bright light and you will find a purple haze around the light, or a “purple halo” which many iPhone 5 users are complaining about. Again, this is an area where the upcoming Nokia Lumia 920 may trump over the iPhone 5. 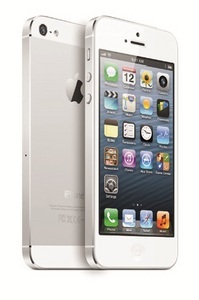 The iPhone 5 has 25 hours extra on the iPhone 4S, bringing it up to 225 hours standby and up to 8 hours talk time. I found the call quality very clear and when compared to the iPhone 4S, it wasn’t as tinny and there was less echo from the surrounding area of the person you are calling. 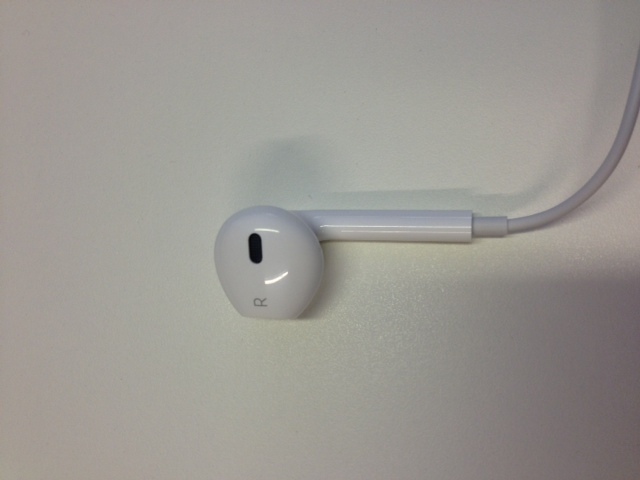 The earphones have been redesigned and are much more comfortable to wear than the previous design. They sit securely thanks to the rounded tip that fits inside the opening to your ear. Those genius people in Apple have also moved the headphone socket to the bottom of the device, mirroring its iPod touch devices, which is much more convenient as the wires don’t tangle up as much. The iPhone 5 comes preloaded with Apple’s new operating system, iOS6. However, the OS is still available to existing Apple users (with functionality varied depending on the age of your device. I took a look at the new iOS6 last week and despite the major issues with Apple Maps which have stopped some users upgrading their device all together, I was pretty impressed with the features that I was able to use including extended use of Siri, a Do Not Disturb function and passbook. While there has been serious problems with Apple’s Maps app, I would think they will be working around the clock to update Maps to actually show stations, roads and err places very soon. The iPhone 5, like its predecessor, is a pleasure to use and hold. Yes it’s a great piece of kit, yes the company produces amazing, game-changing pieces of technology. But why does one slight upgrade and a few “dramatic” changes cause such a furore in the technology space? If you fancy yourself an iPhone, definitely get the 5, but I won’t be cancelling my 4S contract and paying an extortionate amount just to get my hands on something that millions of others have also got. When the time comes, I will upgrade to the latest model, but will everyone please calm down?! The iPhone 5 is available on Vodafone business tariffs including the 24 month Vodafone Red Business data plan. This is available for £45 per month (ex VAT) and provides a free device, unlimited minutes, unlimited texts, 2GB data and a dedicated landline number on your iPhone. I'm with you when it comes to the iPhone 5. I think its more of a remodel than an upgrade. While the camera does allow more light in, they still haven't done much with the zoom. I have been using an iPro camera lens that attaches to my iPhone 5 to get better pictures.